February 18th in Viral, Wordpress Plugins by Wordpress Jedi . There are plenty of plugins that let you build simple forms for your audience. Have you ever wanted something more sophisticated for cost estimation and other similar forms? ez Form Calculator for WordPress is just the plugin for the job. It lets you create checkboxes, radio buttons, and other elements to create advanced cost estimators. ez Form Calculator allows you to provide your visitors with a more interactive experience while ordering or looking up costs on your site. 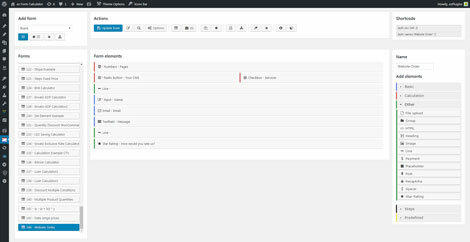 It has a drag & drop builder for form generation. You will be able to perform multiple calculations with each element. Over 15 form elements are available. ez Form Calculator is WooCommerce friendly. It integrates with PayPal and generates PDF files from submissions to make your life easier. You can use it to calculate savings, shipping costs, customize services that can be ordered, and more. It is a commercial plugin by an Elite Coder.